A recent re-reading of Chitty-Chitty-Bang-Bang inspired today’s post! This highly entertaining and action-packed book was written in 1964 by Ian Fleming. Yes, THE Ian Fleming. Who knew the book would lead us on a mission of the chocolate variety? Chitty-Chitty-Bang-Bang follows the adventures of the Pott family and their fabulously magical car, Chitty-Chitty-Bang-Bang. At one point in the story, some gangsters force the Pott twins, Jeremy and Jemima, to assistant in the robbery of Le Bon-Bon, the world’s most famous chocolate shop. The clever children manage to save the day, and, as a reward, the shopkeepers reveal the secret recipe for their famous fudge (which they pronounce “fooj”). The recipe is included at the end of the book (click the image to enlarge it). From Chitty-Chitty-Bang-Bang. Random House, 1964. So…what does the famous fudge taste like? Does the recipe hold up after 51 years? Katie decided to test drive it in her kitchen. Take it away Katie! With my trusty sous-chef son by my side, we gathered and set out all of the ingredients for the “fooj.” There were only a handful of items needed to make the fudge and most we had on-hand in our pantry. We did have to purchase corn “sirup” (we went with the clear corn syrup, not dark) and a bar of unsweetened chocolate (from Ghirardelli, yum!). We also had to figure out a few measurements, like how many ounces are in a tablespoon (the answer is 0.5 ounces). We took a wild guess at how much evaporated milk to use because the recipe called for one small can, so we used a 5 ounce can rather than the 12 ounce. Trusting our guts and confirming measurements courtesy of Google, we set forth to make our own batch of fudge. We followed the recipe exactly as it was written. It took some time to slowly melt all of the ingredients together, but this step probably would have been faster if we hadn’t used frozen butter. It didn’t take long for the mixture to start boiling, and we were careful to not let the chocolate burn on the sides of the pot. 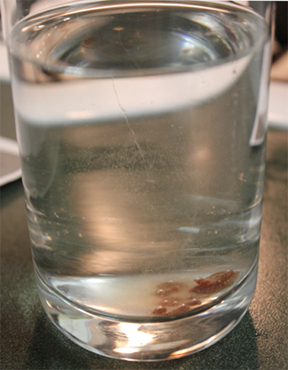 Incredibly, the fudge did form into little balls when dropped into a glass of cold water! I was skeptical of this description listed in the recipe, but was amazed when we watched it happen. 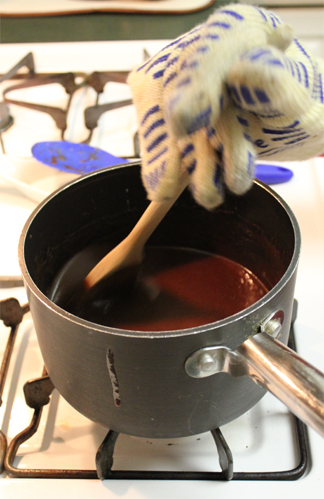 We even beat the boiling hot fudge mixture with a wooden spoon instead of the silicone mixing spoon we had been using earlier. 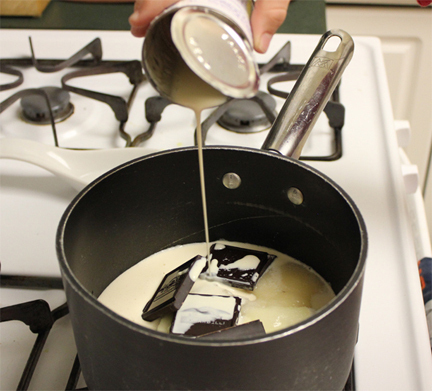 Once we decided it had been appropriately beaten, we poured the concoction into a greased pan to cool. I used a toothpick to draw lines and mark the fudge into small squares. This is when I had my first inkling that something was not quite right. The marks immediately disappeared. I figured the fudge just needed to harden and then I could redraw the square lines. However, the fudge never hardened. It remained a gloopy, runny mess. 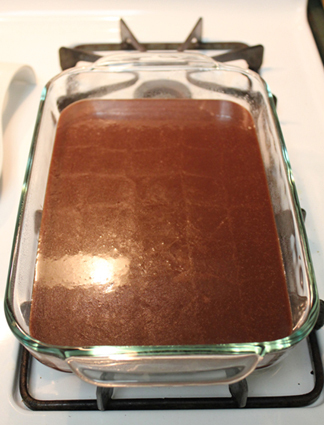 I put the fudge into the freezer to see if that would help the hardening process. Freezing it worked great, but then the fudge was rock solid and nearly impossible to cut. Once it cooled, it was back to its original state. Cue sad music. Fudge failure. Boy, age almost 9: I think it looks like fudge. It tastes good, really good! Can I have more? Girl, age 10: I think the fudge kind of looks like brownie batter. Mmm, it’s good! Boy, age 8: The fudge does not look like fudge. It’s not square. It’s flat and round, like a pancake. It tastes sweet, but it doesn’t really taste like fudge. It tastes like a Hershey chocolate bar. Girl, age 9: It tastes like chocolate. I can’t tell if it’s milk chocolate, but I like that it is creamy. It doesn’t look like normal fudge, but I like it! 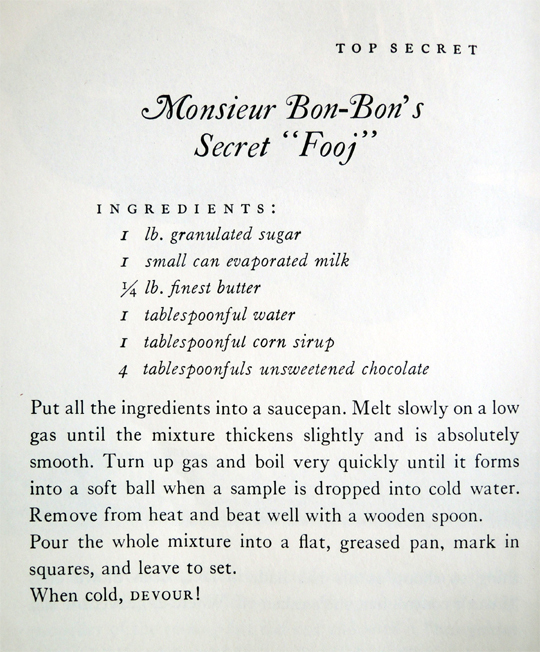 Monsieur Bon-Bon’s Top Secret “Fooj” recipe remains a secret because somewhere between the written page to my kitchen, the recipe got lost in translation. In an effort to discover what I may have done wrong, I again consulted Google and learned from experienced bakers that making fudge can be quite a difficult task. It has to be boiled to a certain temperature after slowly melting the ingredients together, and it has to be beaten for an exact amount of time before pouring it into a pan. Apparently I failed at one or both of these steps. Perhaps the fudge needed to be shaken, not stirred. 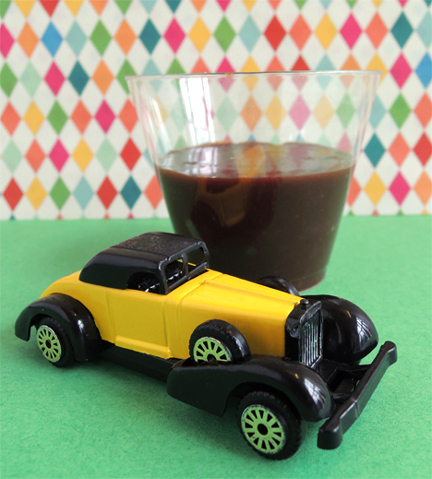 This entry was posted in More Connections and tagged children, Chitty-Chitty-Bang-Bang, cook, cooking, creative, fooj, fudge, how to, Ian Fleming, instructions, kids, library, literacy, Monsieur Bon-Bon's Secret Fooj, recipe, taste test, test by Dana Sheridan. Bookmark the permalink.